I f you are tired of using paint rollers all the time and having bad results then I recommend you to go for paint sprayers. They are faster and provide far better quality than a paint roller. You can find paint sprayers almost everywhere. But clearly, just like for every tool, there are low-quality paint sprayers and high-quality paint sprayers. Unfortunately, you can't know if a paint sprayer is good or bad without using it for a while. There are a lot of different models and types of paint sprayers, so you can't buy and use every one of them until you find the right one. right? Of course not, but what you can do is search on google or on our website to see what paint sprayers we are using. There are a lot of different models for paint sprayers. There are LVLP Paint Sprayers, HVLP paint sprayers, Airless Paint Sprayers, Electric Paint Sprayers and many others that can be used for different tasks. Paint Sprayers can be used for everything. I use them for furniture, cabinets, cars and they make my life easier. You can think of paint sprayers as an investment. Furniture tends to look old after a few years, especially if you use them a lot. After a while, you will have to change them since they start looking ugly. Buying new ones will cost a lot of money, and you will have to buy new ones after a few years and so on. So instead of spending a lot of money every few years and a lot of time [ choosing the new furniture and moving the old furniture out and moving the new furniture in ] you can just buy a paint sprayer and spray paint them by your self. Spray painting is not an easy task to do. Depending on the model you are using You will need to have some experience to get some good results. But if you use models that are made for homeowners you will complete your tasks easily. But you can use paint sprayers for different tasks as well. Like paint spraying your car, your house or different surfaces. You can't use home-owners models to spray paint your car. You will get an extremely bad quality. There are models that are made only for home use, there are models that are made for professional tasks and so on. 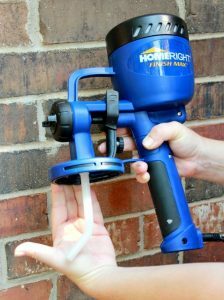 So, before buying a paint sprayer make sure to do your research and see which model works better for your project. There are a lot of different guides and reviews on the internet that you can check and read to learn how to use a paint sprayer and which one to buy. You can also read our blog to see different guides, reviews and tips & tricks about paint sprayers and almost every other tool.